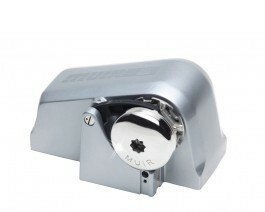 Muir's anodised aluminium housing and top coat with quality AWL GRIP silver metallic finish looks stylish and made to last in the harshest of environments. Powerful 400w\/12v DC permanent magnet motor coupled to heavy duty gearbox, offering greater pulling power and longevity. New S5316 components, including S5316 Clutch Cap, Stripper and Peeler. Motor and gearbox combination with CRC Soft Seal covering film provides additional protection and trouble free operation. Simple above deck unit for the easiest of installations and minimal intrusion into the chain locker. Compact design perfectly suited where the deck area or chain locker space is at a premium. •et; Circuit breaker & mounting panel w \/ LED. •et; Helm control rocker switch & mounting panel. •et; Reversing solenoid kit - 12v 2-4pole. •et; Deck mounting studs & fasteners. •et; Vessel Length: 5, 6, 7, 8. •et; Power Supply (DC): 12V. •et; Amps Work Load: 60. •et; Max Line Speed: 23m\/min. •et; Chain Size (MM): 6.